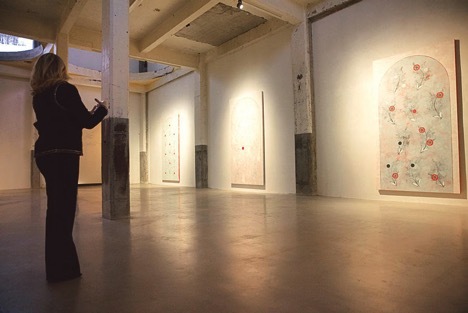 An international contemporary art exhibition, which has recently opened in the Belgian city of Anvers with the support of Turkey’s T-ONE Association, has drawn great attention since the opening day. The exhibition titled “The Crime of Mr. Adolf Loos” at Axel Vervoordt Gallery, a significant international art platform, has been visited by 750 people within three days. Curated by English curator, writer and advisor Alistair Hicks, the exhibition features works by Turkish artists of various generations including Fahrelnissa Zeid, Nilbar Güreş, Aslı Çavuşoğlu and Cansu Çakar, as well as works by international artists such as Guogu Zheng, Kamrooz Aram, Nikita Alexeev, El Anatsui, Senkichiro Nasaka, Waqas Khan and Yangjiang Group. Speaking at the opening of the exhibition, T-ONE Association President Demet Sabancı Çetindoğan said that she was pleased that works by Turkish artists were displayed in such an important group exhibition. She said that they supported the exhibition in line with the aim of carrying Turkish cultural values to international platforms and working in communication, media, art and organization in order to provide intercultural and permanent communication and interaction. In his 1908 essay “Ornament and Crime,” Loos declared that you could not be decorative and modern. He makes no good arguments for this outrageous claim, just asserts it. Yet this view of Modernism has under-pinned the last hundred years of mainstream Western art history. The exhibition is devoted to contemporary artists who are resisting Loos’ edict. They are finding their own balance between simplicity and ornament. The aim of this show is not only to make people re-examine their prejudice against ornament but rather to show that a curved line is every bit as revealing about the way we think and feel as a straight line. The exhibition will be open through May 26.